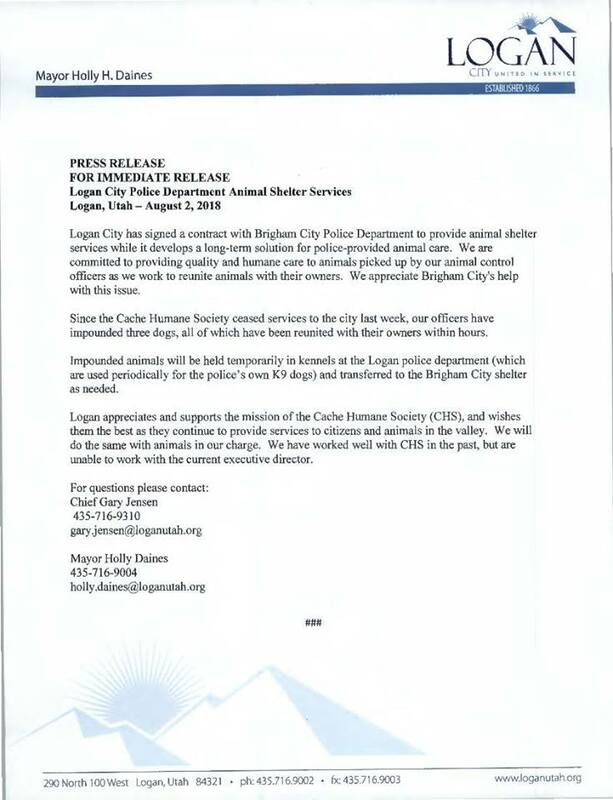 In a press release from Logan City Thursday afternoon, an announcement was made that an agreement had been made with Brigham City Police to store animals on a need-be basis in Brigham City. Animals would be stored at the existing canine kennel facility that Logan City has and if they need to, in order to free up space or for some other reason, could be transferred to the shelter in Box Elder County. It is a temporary measure after a contract could not be agreed upon with Cache Humane Society. On KVNU’s For the People program on Thursday, Logan City Police Chief Gary Jensen was asked if there is a possibility that things can still be worked out with the Cache Humane Society. Jensen said they do not anticipate a high volume of animals needing to shipped to Brigham City. He said since the cut-off of services with Cache Humane Society, they have had three dogs impounded and each one was reunited with their family in a couple hours. He said he’s sure that the Cache Humane Society will continue to serve the community, it’s just that the Logan Police Department will simply go in a different direction. As far as a Logan City shelter that has been rumored on social media, Jensen said that discussion hasn’t even begun yet. Cache Humane Society director Stacey Frisk told For the People host Jason Williams on Friday afternoon that they have been waiting to hear back from anyone with Logan City. But, she said, all they’ve been getting is messages from Logan officials through the media. Frisk said, too, that they assumed as the process moved forward, that local veterinary clinics would be used in housing animals both locally and humanely to give their owners time to find them. So it was news to them that they would instead be transported to Brigham City.